FLOR and Martha Stewart Living Omnimedia's design staff have produced the new Martha Stewart Floor Designs with FLOR Inspirational Photo Gallery providing DiY designers with creative ideas. Featuring a variety of rooms and decorating styles, the new Inspirational Photo Gallery shows DiY designers how to use modular carpet tiles to create custom looks for updating their homes. These eco-conscious carpet tiles come in a range of colors from soothing neutrals to rich earth tones that bring the beauty of nature indoors. Martha Stewart Floor Designs with FLOR are also eco-friendly. In keeping with FLOR's proactive environmental mission to create healthy flooring alternatives, Martha Stewart Floor Designs are created with low-VOC recycled content, which is better for the home and for you. What do you think about the FLOR concept of modular floor tiles? Would they work in your home? 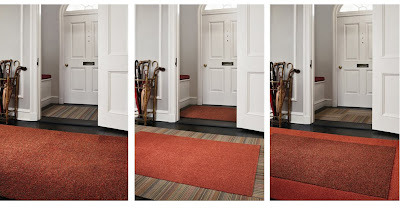 Three different looks within a consistent pallette of carpet tile tones. I used the FLOR tiles in my mudroom. They fit perfectly - as it is a square room. It was hard to find square rugs, so when I saw FLOR's and Martha's line, I knew that would be the answer. The tiles are 20" x 20". I have 4 fitting together to form this wonderful square rug. Great, rugged material, and it looks stylish as well!